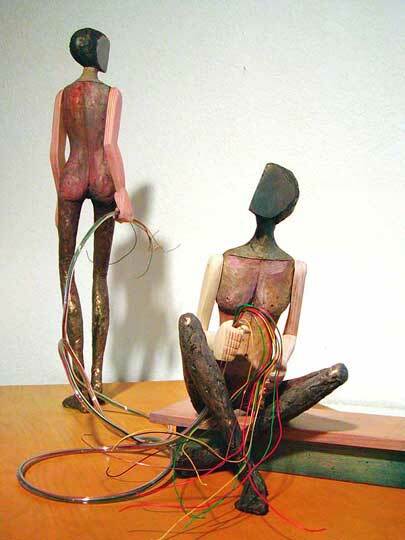 Painted bronze, plastic and wire, 2004, 18" x 30" x 23". I am the youngest of a descending line of three boy cousins and one sister, roughly two years apart. My sister, two years older, was always more anxious to keep up with the boys than inclined to wait for me. I settled into my role as the baby, and learned to entertain myself and be self-reliant. In fairness to her, I was odd during a time in her life when an odd younger sister was a definite liability. Then I moved a half a continent away. Over the years she became a conduit of news from the cousins and my hometown. With her feet firmly planted in the present, she appeared to have no interest in the past and its emotional quagmires, while I continued to muck around in them in search of a path through the present and into the future. For years I was secure in the thought of my sister being out ahead with my cousins, forming a distant calvary which could swoop in and lead me to safety if needed. It took the death of my father to make me realize that there might be times when those roles would reverse and that my years of solitude and inner exploration had forged me into an intrepid pathfinder capable of guiding the calvary through unknown territory.